Good to know the characters aren’t stupid. I can’t stand that. I’ll have to read this one. Stupid characters kill a book for me! An asylum now haunted? Well, of course I want to read this! Sounds like a creepy, good story! Supernatural mystery suits me better than horror, admittedly. This sounds really good, Lark. I enjoy a good ghost story. Ooh, I love a good ghost story! I'm definitely adding this one to my wishlist. Supernatural mysteries are some of my favorites. Hi Lark, I like these kind of books too where a group of interesting and different characters arrive at a haunted mansion and scary things start happening but no one can leave. 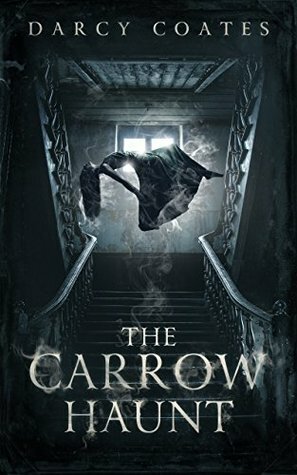 I want to get more into the supernatural and the Carrow Haunt a good place to start. I've been seeing this author everywhere! I'm glad you liked her writing. I have one or two in my tbr pile. I haven't heard of this one, but it sounds right up my alley! I'll definitely check it out. Thanks for the review of this novel!! I've never heard of it before, so new to me author and book is a plus for me. I am glad The Carrow Haunt is more supernatural mystery and suspense than horror as I am not a huge of horror. :D Then I think you'll like this ghost story!